The tracklisting seems to have been corrected, but the albums seem to be Magnetic Fields, Zoolook, Rendez-Vous, Jarre Live and WFC. Alas, another one of these Sony "cash-ins". Which of course begs the question, do they actually earn more money from these plain bonus-less horribly remastered "boxsets" than they would from boxsets of the same price with a lot of extras (yet most likely still badly remastered)? Just a re-release of the latest remasters I assume? 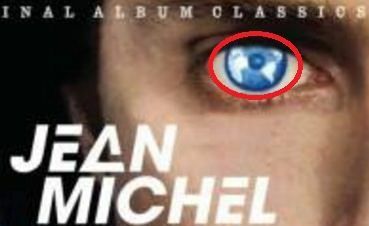 The image of the Earth in the eye of Jarre was inverted. Yet another David D-water promotion? I hope not. A lot of JMJ's fans have had enough of David "lol how do i into remastering?" Merdeau, I really don't know why the record companies still let him remaster music. Never heard of those records… Oxywhat? I'd tip my hat to anyone who'd manage to sneak in a credit like "Badly remasterd by Dadwater". Jean-Michel Jarre Original Album Classics Vol.2 [Import allemand] Import - Released on 16/03/2018.